Original paintings and Drawings for sale. The paintings span a large range of David's work, some are over 50 years old and several have been painted within the last 10 years. These have a deep richness of colour and beautifully capture the character and atmosphere of the streets at that particular time. 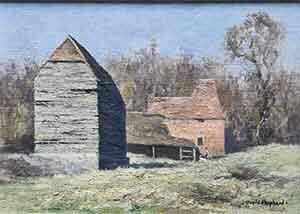 The landscapes were painted in Surrey and Sussex, and there is one rather rare painting of the steep hill in Lincoln. 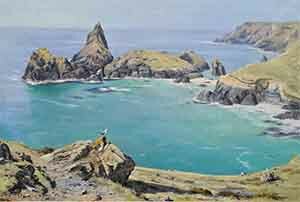 'Kynance Cove' in Cornwall was David's 5th print to be published and disributed by Boots. 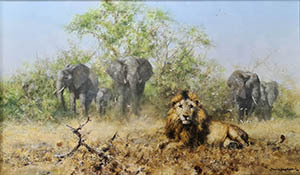 The 'Elephants and Lion' painting was commissioned by a collector working in Tansania, it was an actual scene that he remembers well. 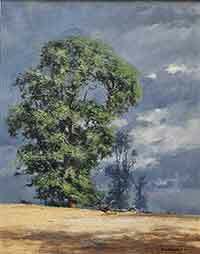 30+ years experience, specialising in original paintings drawings and signed prints by David Shepherd. In the early days David Shepherd set off to the Slade school of fine art in London with his bird picture, unfortuinately he was told that he had no artistic ability and that instructing him would be pointless. Driving a London bus was beginning to appear the extra likely possibility, until by complete coincidence, he met an artist called Robin Goodwin who was regarded as a highly skilled marine artist. He never worked with apprentices, but luckily for David Shepherd, he agreed to see some of his work. 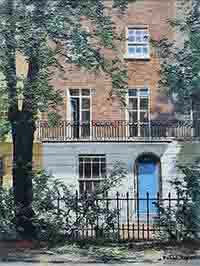 The very subsequent day David Shepherd arrived at Robin Goodwin's studio in Chelsea with his 'bird' painting, and to David's sheer amazement Robin Goodwin agreed to help him. It is because of this artist that David achieved the creative staus that he enjoys in the present day, and has at all times a feeling of deep gratitude for the help he acquired from Robin Goodwin. David Shepherd's first autobiographical book 'The Man Who Loves Giants' was published in 1976 which very quickly became a best seller. This was revised and updated in 1989 as subsequent editions were published. A second book illustrating his love for steam trains was published in 1984 'A Brush With Steam' and in 1985 'The Man and his Paintings' was the first comprehensive book showing a complete spectrum of David's work. 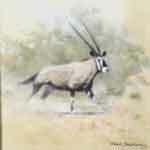 'An Artist in Conservation' was released in 1992 which illustrated some of Mr Shepherd's finest paintings. 'My Painting Life' and 'Only One World' were published in 1995 'Panting with David Shepherd, Unique Studio Secrets Revealed' was published in 2004.